Baby schedule for newborns. 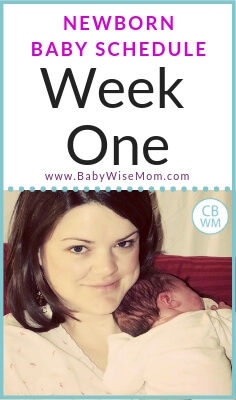 Babywise newborn schedule and routine for the first week of life. Read all about this baby’s first week. I thought it would be interesting, and hopefully helpful, for me to summarize life each week. I will do this until it doesn’t seem worth it anymore :). These first weeks can be so hard and require so much troubleshooting that it can be nice to see what others have done. Before I start, please do not be discouraged by the smooth things for us. Not only is this my third baby, but in writing this blog I think about this stuff all the time. All the help that I have given to others has taught me a lot. So not only do I have my personal experience, but I have learned a lot through the experiences of others. With that in mind, here are some interesting points from our first week with McKenna. While still in the hospital, my husband and I noticed that McKenna had gas pains. Brayden was also a baby who had gas pains, though we didn’t notice until he was 6 weeks old. And when I say we, I mean a friend of my little sister’s noticed. Her baby (who was then 9 months old) also had gas, so she recognized the symptoms. Luckily for McKenna, we were much faster at noticing her gas pains. Kaitlyn never had gas pains. Because of our experience with Brayden, I bought several bottles of the gas drops before she was born, only to literally throw them away last fall when they expired. This time, we didn’t have any purchased. My husband went to the store and bought some gas drops before we left the hospital. I then started giving her gas drops after every nursing. The first couple of nights home, McKenna had severe gas pain for a period in the middle of the night. Since then, however, she has been fine. The gas drops seem to be doing the trick. McKenna is a great nurser. She is efficient and has an excellent latch on. She has nursed well from the beginning. In The Baby Whisperer Solves All Your Problems, Hogg mentions that your baby needs to nurse at least 15 minutes on one side to get all the fatty milk she needs, but preferably a lot more. She suggests you shoot for that length of time before switching and offering the second side. She wants you to focus on single-side nursing. I have always been a two-side nurser. McKenna does both right now. About half of the time, she literally refuses to even open her mouth for the second side (not to try to put actions in a newborn that aren’t there; she just really isn’t interested in that second side). It isn’t even that she is asleep and hard to wake up. Her eyes can be wide open and she just isn’t interested. Kaitlyn was one who nursed 10 minutes on each side from birth. She gained weight really fast. Despite that, the words of Hogg have been ringing in my ears bringing me doubt in the ability of McKenna to get what she needed in 10 minutes. Today I read What to Expect the First Year. I like their advice on nursing length. That is that every baby is different and nurses at a different pace. They also mentioned that some younger babies simply can’t handle nursing from more than one side at a time at first. McKenna is a tiny baby, so I can see that being true of her. Ultimately, McKenna is a fast nurser. Sometimes she will take two sides, sometimes she won’t. I still have to wake her for 6 of the 8 feedings in a day (including night feedings), so she is obviously getting enough to eat right now. I know I have more than enough milk, so she is just getting satisfied with one side for now. Something interesting about McKenna that I noticed in the first couple of days of her life is that a diaper change in the middle of a feeding is never productive. This trick was my sure-fire way to get Kaitlyn to wake up to eat for side two. For McKenna, it seems to prevent any chance of her eating from side two. I just have to get her done as fast as possible. I always hate figuring out how to best burp the baby. I don’t consider myself a good “burper.” What worked for one child isn’t necessarily going to work for another. Honestly a very happy time for me is when baby finally gets to that point where burping is easy. Burping is very important. I have had two babies with gas and one with reflux, so I know how vital it is. Hogg had the trick for McKenna in her book under her section on “gas.” That is to rub up the left side of baby’s back under the ribs. This is where the stomach is. This works really well for her. I am a lot smarter about waketime with McKenna than I was with Kaitlyn. With Kaitlyn, I tried to keep her up for an hour at a time. I have since learned that for a newborn, a much shorter waketime is perfectly fine (when looking toward nighttime sleep) and preferable. McKenna’s waketime lengths vary from 30-45 minutes. I do not watch the clock for the length; I watch her. But I do take note of what time I got her up and what time I put her down. Our activities are very simple. We eat. We change diaper. We change clothes if needed. We do sponge baths and wash hair. We look into each other’s eyes. That about does it. There are a couple of times a day that she has interaction from her siblings. They hold and kiss her. But I try to keep those interactions short and few so she doesn’t ever overstimulated at this young age. She will also have some interaction with Daddy, but it is calm :). McKenna ate at 10:15 PM, 12:00 AM, 2:15 AM, 4:45 AM, and I woke her at 8:15 AM. What a night! Why so many feedings? One, she is small. She is under 6 pounds, so I definitely wasn’t going to try to hold her out at all if she was hungry. Also, my milk was still colostrum and I don’t think that was holding her over. Finally, she had awful gas pains that night, so she woke frequently. McKenna at at 9:50 PM, 1:30 AM, and 4:00 AM. I got her up at 7:45 AM. This was much better. She did have a gas pain situation this night, also, though. McKenna at at 9:50 PM, 1:45 AM, and 4:45 AM. I then woke her at 7:45 AM. This was the night that I first had to wake her for a night feeding. I woke her at 4:45. I could let her go up to 5 hours, but I want to keep morning waketime as consistent as possible. I also need to have at least 8 feedings in her and she does better with a longer schedule in the day–resulting in needing two night feedings right now. McKenna at at 10:15 PM, 2:15 AM, and 6:15 AM. I woke her at 8:15 AM. I woke her for all four of these feedings listed. McKenna at at 10:00 PM, 1:35 AM (she woke for this), and 5:15 AM. I then woke her at 8:00 AM. Naps are going really well. I wake McKenna for the great majority of her feedings. This is not uncommon with a newborn. We swaddle McKenna for all naps and nighttime. She likes to be swaddled tightly. McKenna also puts herself to sleep. I implemented the 4 S’s described in Hogg’s book The Baby Whisperer Solves All Your Problems when McKenna was three days old. McKenna goes down for every nap of the day awake and has never cried for even a second. Love it! McKenna sleeps at night in her bassinet in our room right now. She takes all but one nap in her crib in her room. So there are the basics of our first week. I have a few things I have learned that I will put into individual posts. All in all, I am completely satisfied with how things are going so far. Kim, BW does say that 8 week olds are capable of sleeping through the night, but it also mentions that they can take up to 12 weeks old (at least my edition does). Personally, my son woke every 3 hours at night up to 6 weeks old, then had a growth spurt and woke every 2 hours for a few nights, then returned to the 3 hour waking. But at exactly 8 weeks old, he suddenly slept 5 hours, the 6, 7, and then 10.5 hours. So by 9 weeks he was sleeping through the night completely. Your baby’s waking pattern right now may not be indicative of whether he will or will not begin sleeping long stretches in 2-3 days. I wouldn’t stress about it until 12 weeks old. But in the meantime it couldn’t hurt to perhaps keep to a strict 3 hour schedule, and even include an extra feeding in the evening to do some “cluster feeding”. The Baby Whisperer suggests this and it always worked for us. To show how that would look as far as a schedule, our schedule at 8 weeks (very roughly) was this: 6am nurse, 9am nurse, 12pm nurse, 3:00pm nurse, 5:30pm nurse, 7:30pm nurse, 10pm wake to nurse then put straight back to sleep. I hope that helps a bit!Valerie, thank you so much for doing these kind of posts, it really brings back the normal reality of a newborn as opposed to the ideal we all strive for in our scheduling. I’ll definitely be referring my friends with newborns to these posts! I had a baby with reflux and always guessed she had gas pains, but was never really sure. How did you know that McKenna had gas pains? What exactly are the symptoms that she shows? Yes, I’d also like more details on those gas pain symptoms. Also, I’m curious about Hogg’s 4 S’s that have helped McKenna sleep on her own so well. If you already have a post planned for the future, don’t worry about it, I’ll read it when it comes up. I’m thinking I should read her book…. 🙂 Thanks for this detailed account of the first week. What a great reference to the reality of newborn life–even with Babywise. Great post. Glad to hear things are going so well! Wow, you seem to be adjusting to this new little person so well! Good for you! I also love schedules and think that babies are just so much happier on them. I will definitely be taking more of your advice when baby #2 comes along – but not for a while yet, #1 is only 10 1/2 months! Congratulations on your newest little angel! I’m in awe that she can go to sleep on her own. I have a 5 1/2 week old that I’ve been soothing to sleep and I want to get him to self-soothe. Right now I have to get him REALLY sleepy before I lay him in his crib (swaddled) and sometimes he wakes right back up or only sleeps about 20 minutes. How much crying is this going to involve? (We did the extinction method with our 20-month old when he was 4 months and we had a few nights of crying but it didn’t bother me because he was a little older…5 weeks seems so young but I need to do something, I’m going crazy spending so much time soothing only to get a 20 minute nap and an overtired baby!) Any suggestions you can give me would be much appreciated. I know you’re super busy right now! Glad things are going so well. I have a couple thoughts…First, one additional worry about not nursing long enough on a side is that your baby will get too much of the foremilk which could cause stomach upset bc of it’s high lactose content. But some babies are fast eaters and some moms have less milk per side (and more or less lactose) which will make a difference. What I’d always do is burp after my son unlatched then have him try and eat on the same side again. Once he came off again I’d move onto the other side.A great burping trick I learned was bouncing my son up and down gently on my lap and then holding his neck/head in my hand while he was sitting in my lap and moving him around in circles.A good trick I thought of for middle of the night feedings was using an egg timer and setting it for the longest period of time I wanted him to go at night everytime I got up to feed him. That way I didn’t have to keep setting my alarm and trying to figure out how long it had been since he last feeding and constantly adding up numbers with my sleep deprived brain. During the day I’d press start when I got him up for a feeding so I could use the egg timer as a reference for how long the wake time had been so far and how long it had been since he had last eaten etc.Baby Whisperer’s 4 S’s:*Setting the stage (getting environment ready for sleep)*Swaddling*Sitting (quietly, without physical stimulation or even rocking with baby in a vertical position possibly with face tucked into your neck or shoulder to block out visual stimulation)*Shush-pat if baby is having problems settling(make a shushing sound and pat in the center of his back- do in crib or with him over your shoulder if he isn’t settling in the crib then lay him back in the crib and continue the method until baby calm even more). I never had much luck with the shush-pat. It seemed to stimulate my son more (I admit I wasn’t extremely consistent with it though). I still don’t understand how this isn’t a bad sleeping prop. We have a one week old and can’t get him to sleep more than 1-2 hour increments at night. I’m wondering if he has gas problems, because he’s so fussy and lets out a cry every now and then. Also, he seems to sleep better on his stomach, but with the whole SIDS thing I’d like for him to sleep on his back. We really like the baby wise method of PDF but didn’t know if you could start this in infancy. This is our first baby and were told to feed him every 2 hours in the day to establish my milk, and then every 3 to 4 hours at night. We’d love it if he slept that long, but apart from sleeping on mommy’s or daddy’s chest it doesn’t happen. Please help. I don’t want to get him used to any bad habits, can you at this young? I just wanted to say good job, mom. Experience helps, but it takes diligence to wake up a sleeping baby when you yourself are exhausted, too. I’m sure it will pay off to be on the ball in these early weeks. You have been such a help to so many. Thank you for continuing to post even though you are juggling a family of 5 now. Kim – I second what the previous poster (Kyle, Amanda, and Tobias) said – about giving it time and trying to cluster feed in the evenings. Both of these things are what worked for us. I was extremely ready for our little girl (now 5 months) to start sleeping long stretches at night. I remember the exhaustion so well! I just KNEW that I would be better for her once I could get more sleep. She did not begin sleeping through the night until between 10-12 weeks and even then, not consistently for a few more weeks. I read somewhere that babies are not capable of sleeping through the night until they reach 12 pounds. I’m not sure whether this is true or not, but our baby was small and slow to gain weight so that may have contributed to her needing those extra overnight feedings for longer. Either way, just do whatever works for you to make it through those long nights (sleep during the day, etc.) and soon your little one WILL be sleeping through the night. I definitely suggest cluster feeding in the evening. This really helped our little one to pile on the food and go longer stretches through the night. Eventually we got to just one overnight feeding and that was much more manageable for me. Try 3 feedings at 2 hour intervals in the evenings. Hope this helps or at least encourages you! 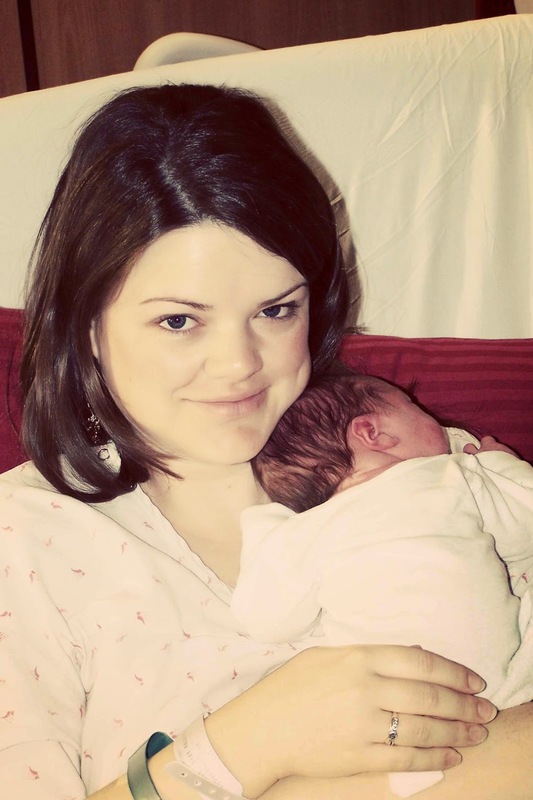 Laura – we started Babywise from birth with our baby. From our experience, and from what I understand from others, it is not too early to begin. The most important thing is definitely the feed/wake/sleep cycle. If you do this consistently, it should help your baby understand that nighttime is for sleeping and help him go longer stretches overnight. Also, if you are certain that you have established a healthy milk supply, I would not hesitate to move to a 2.5/3 hour cycle during the day. This should help him eat better when he does eat. As far as getting him down to sleep, I would suggest transitioning towards sleep (making the room dark and quiet, talking or singing gently for a few minutes), making sure he is drowsy and then laying him down awake. A few minutes (5-10) of fussing/crying at his age is not too much as he settles for sleep. As you do this routine consistently, he will begin to understand that those are signals for sleepytime. But do remember that he is young. If there is one thing I wish I had done with my little one (she is 5 months), it’s to relax a bit in the beginning. Yes, it is important to set healthy habits from the beginning and to be as consistent as possible, but he is too young to develop bad habits at this age. Keep being consistent and give him the extra love he needs to get comfortable with his surroundings and his routine. All the best to you and your new family!MelissaPS – Don’t forget to get some rest! Melissa,I can identify! My son is also 5 1/2 weeks and what you describe is exactly what happened with my first baby (didn’t do BW at all) – it was so frustrating and exhausting. This time I really concentrated on getting full feedings from birth, and pumped a lot more so I knew how many ounces he was eating. He’s just now upping to 5 ounces at most feedings, so when he does about that, I know he is full. It was hard to tell when my other one was full with just breastfeeding. After only about an hour total of feeding, burping, changing, I would see this one’s eyes get heavy or see the fussing. I just kept working on putting him down in the bassinet and rubbing his cheek then. We use a pacifier, too.He would then have a couple naps where he could soothe himself, and a couple (esp. in the evening) where he couldn’t and we would hold him. But with every self-soothed nap, I considered it an accomplishment! I agree that it is too early to CIO at 5 weeks, and I wasn’t comfortable doing even the 15 min that BW says, but keep trying to put him down with a very full belly and clean diaper after a short waketime when he gets fussy, b/c it did help my little guy sleep on his own, just not all at once. I cheered when I got one self-soothed nap in that lasted an hour or more each day at first! Now he doesn’t really nap well if he falls asleep right after eating – almost as if he needs the waketime to realize that a longer nap is coming. Give a post when you get your first longer nap in – it’ll happen! Thanks for the encouragement Kim! I think sometimes I forget that part of the waketime includes the feeding, changing, burping. Plus I’m a type-A perfectionist, so I think I’m programmed to expect it to happen all at once. You’re right – even if I could get one self-soothed nap it will be progress. I’ll let you all know how it goes! Oh, and I do have to disagree with a previous comment about habits. I believe the development of habits start the moment your baby is born. That being said, you still don’t want to obsess over doing everything perfectly in fear that you might be creating some kind of bad habit. This will just make you unhappy and make it hard to enjoy baby. You do want to try and have consitency and avoidance of possible “bad” habits MOST of the time though. And if you find you end up creating a habit that you aren’t very fond of later on, you can always change things. It may be a little more difficult than avoiding the habit in the first place, but it is never too late to change things! So glad you are updating us on your newborn journey. I have a 4 wk old and she’s really getting into her routine. It’s so encouraging that you too have a newborn. I will have family staying with us this week and have been stressed about the routine getting all “off”…but your posts about being flexible have been very helpful and encouraging. I can become such a mama bear when it comes to her schedule/routine…I was much worse with my first…but I just need to remind myself, as you have often said, the schedule/routine is there to free me not bind me or make me growl at anyone coming near my baby. Congratulations to you and your family on your new bundle of joy. Sounds like you guys are doing wonderfully! I am having a problem getting my 4 week old to nap at all. I know he should only be up for 30-60 minutes, and he’ll stay awake easily for 2 hours and nap for 20 minutes. I don’t really feel comfortable letting him cry at this point, but will when he gets closer to 2 1/2 months. I’m not sure what to do. He isn’t sleeping well at night either. He wakes every 20-60 minutes even though he goes down on his own. I feel like I’m following everything and he just doesn’t nap or sleep. He definitely gets overstimulated due to lack of naps, but not sure what I should do about that. Thanks for all this information on newborns. 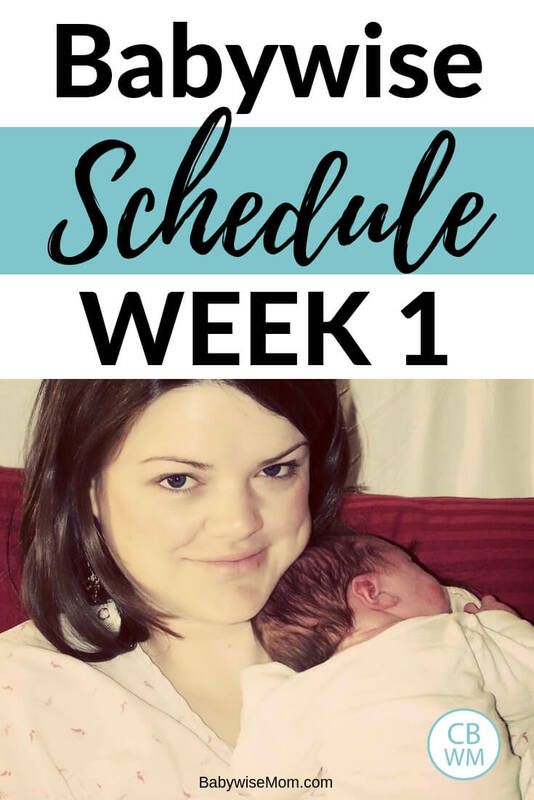 Hopefully it will be easier to start with BW when we have our second – waiting a few months with our first wasn’t the smartest idea.Would you be willing to add to your scheduling with McKenna (as a newborn) to the sample schedules post? I’m curious how the 8am wakeup is working. Are you keeping her up later at night? I’m considering that for our second, but I’m not sure if that will work.Along those same lines – quick question – my 10 month old is waking at 6:20 like clockwork – we “reset” her when daylight savings came around, but she’s back to 6:20! Ugh! Should I put her down a little later? Start with 7:15 and then move to 7:30? Her current bedtime is 7:00 and sometimes we put her down a little early if she’s not napped well b/c of illness/teething…Thank you for all your posts! CO Mom, it may help to put her down a little later. My 14 month old goes down at 7:30 pm every night and wakes up at 7:00 am. It had been like this for months and then three days in a row she was waking up at 6:15! I was logging sleep times for something else at the time and when I looked back I realized that we had put her down at 7:15 pm those three nights because she hadn’t napped well and was really tired. We went back to keeping her up until 7:30 pm and she went right back to waking up at 7! I couldn’t believe how only 15 minutes at night made a huge difference in the morning. I hope that helps. Good luck! Jennifer,Thanks for your input. I put her down at 7:15 last night after she hadn’t napped as well as usual during the day and she woke at 7am on the nose! I had to fight the urge to put her down early – I’m always worried about her being overtired and not getting enough sleep! 🙂 I think I’m going to go ahead and work up to a 7:30 bedtime from now on. Thanks again for your thoughts! Just a comment about gas pains in baby’s – it’s normally due to something the mom is eating. And I don’t mean spicy or garlicy foods either. A lot of times it’s due to dairy, wheat, eggs, soy or corn. If I only knew the milk I was drinking had caused my son all that pain….. try cutting out dairy and see if it helps! Dvorak – Have you tried swaddling? Boys tend to jerk their arms around more and wake themselves up more often. Gas could also be an issue if he’s not sleeping more than 20 minutes. He could also be to warm or just uncomfortable. Babies also have to learn to self soothe since their sleep cycles are only about 30 minutes long. So every 30 minutes they go into a light sleep state and can easily wake up. If he wakes after only 20=30 minutes or so, let him fuss for at least a few minutes to see if he doesn’t nod off by himself. If not, then get him up. Also, make sure he’s getting in a full meal. My kiddo was such a slow nurser it took forever for him to actually get a full belly since he’d fall asleep after just a couple minutes. And most of all – relax! Babies pick up on mom’s stress! And it won’t be the end of the world if he doesn’t follow the BW plan exactly. Kim,As Amanda said, it does get to longer intervals “suddenly.” They just start expanding. I agree with Amanda to do 3 hours in the day–don’t let him go 3.5. You can try cluster feeding; it doesn’t work with McKenna and Hogg says it doesn’t work for all babies, but it does for some. Thanks for your thoughts Amanda!I am glad you like these posts. I feel like things are going well. Maybe I should do some “retro” newborn posts where I write my memories of newborn life with the other two. Each child is a new experience! Becky,This is the worst answer, but we just knew. I think it is because Brayden had it so we knew what it was. Some signs are a high-pitched cry. It usually comes out of no where. When she had this cry, we would hold her and feel her intestines rumbling. The rumbling alone doesn’t mean gas pain, but in conjunction with the shrill cry, it was a good indicator. Also pulling up of legs. If your baby makes an “O” with the mouth, that is usually gas.Also, if your baby rolls his eyes and pants, that is gas. Brayden and McKenna did/do that, and Kaitlyn didn’t. I always thought it was just a way babies looked when they slept, but Kaitlyn never did it and didn’t have gas. The best indicator is that there are no shrill pain cries when she is on her gas drops. Jennifer, I am guessing you have seen the post by now. You definitely should read it. It is a great reference. Rachel,Thanks for your thoughts. I love your burping policy for feeding. I have done that and it has worked well.Good egg timer tip too.I am glad we haven’t had to use the shush pat because I honestly can’t see it working out for me. I know it works for people. Thanks for your thoughts! Sappies,You can definitely start bad habits this young. This is when they start :)I would really recommend both Babywise and the Baby Whisperer for you. I think you will find the two to give you great direction. Dianna,McKenna does (and did) go right back to sleep after a feeding. Sometimes she gets the hiccups shortly after a feed (I am back in bed by then) and she sits with her hiccups then goes to sleep when they are over. The best thing to do is have them go to sleep on their own from the beginning. They don’t have any other habits that have been trained in them. Then they just know how to go to sleep on their own and you don’t have to worry about it. Also, with the waketime in the day it helps so they can distinguish the night. It is definitely helpful to be able to just put baby down and go to sleep rather than having to rock to sleep before you go to sleep. Thanks for sharing your thoughts Mamunaco! I have read about 12 pounds also. Some say 10, but 10-12 pounds seems to be the standard. Thanks for your thoughts for Laura also! Those are great tips, Laura. I agree with everything other than that you can’t start bad habits at this age. You can, but they are easier to break at a young age also. If you do read The Baby Whisperer, she discusses this at great length and refers to it as accidental parenting. Kim, I am glad you have been able to find support! Melissa Parent,Yes, at first the feeding, changing, and burping basically takes up all of the time. Do keep us updated! Rachel,Thanks for your added thoughts. With the diaper changes, I find I have to change the diaper in the middle of the night with newborns. One night I didn’t with McKenna, only to have her awake an hour later having totally leaked through her diaper. I have decided (just like I did with Kaitlyn but still gambled that night) that it is just worth it to change the diaper and not risk waking due to leakage!Thanks for your “habit” thoughts, also. I agree. Yeah, I did diaper changes with each awakening when my son was a newborn too. I don’t think I started skipping a diaper change until he was starting to eat less at a feeding/getting ready to drop it and therefore was eating less. Dvorak Family,Your answer lies in getting him to sleep at his optimal waketime length. At his age (even now a couple of weeks later) is a very short waketime length–even just 40 minutes. CO Mom,It is definitely easier when you start from the beginning :)I did add McKenna to the sample schedules and I will continue to do so. With the 8 AM waking, I am not keeping her up later at night. I just typically wake her up around 5:30-6:00 AM in the morning to eat, put her straight back to bed, then I get her up at 8 to start the day. I want our waketime to be 7:30, so 8:00 is withing 30 minutes of that. Thanks Jennifer for your thoughts. Timing is important for babies on up through the toddlers. It is always good to track and know what is the optimal timing for your child. Donielle,Thanks for your comment about food intolerances. I actually had already cut out dairy for several days during her first few days as soon as I saw she was gassy. That wasn’t it, but I should try other products like wheat. Also, good point about the sleep cycle. From wat I have read (and found), it is every 40-45 minutes though. Rachel, I can’t remember exactly when we stopped with the diaper change at night. I think it wasn’t until they were big enough that I could go up a diaper size for night, and also until they were eating only once in the night. I will have to take note of what age that is with McKenna. Andrea, I start a consistent time of day from the beginning–especially when I have older children to take care of. My husband isn't home in the morning, so I need things to be very consistent and predictable.Try different times for that last feed of the day (your 11 PM feeding). With my third, I noticed that 10:30 seemed to be the best time (if I remember right) while for my second I don't think the exact time mattered so much, but I did it around 10 PM. My 3rd baby is 5 days old. I was going to wait a week or 2 before getting BW implemented, but last night our sleep was so poor, I became desperate and had to begin CIO it out today for sleep independence. I just can't wrap my brain around a decent schedule for such a young baby, however. And I need help. Also – how do I overcome the anxiety I feel over her being so young and letting her cry…?Can you help me find a schedule that is good for her age (and maybe even an example of up and coming changes as she ages)? Due to a PPD diagnosis after my 2nd child, my anticipation is clouding my ability to figure this one out on my own. :/ OH! And how do you deal with dr's appts and church disruptions and family being in town and wanting to see the baby? Tiff, See my newborn summaries to see how I scheduled McKenna. See also my sample schedules post and the readers sample schedules post. See the blog index and under "Cry It Out" for my posts on that. I also have lots of posts on disruptions, including how we do church. See those and let me know any specific questions you have on those topics. Good luck!